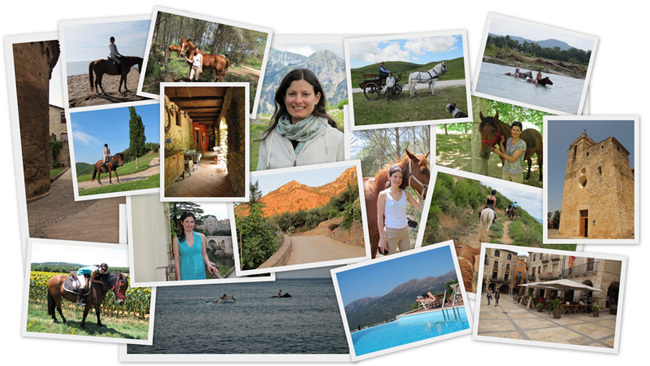 We've been busy updating our trips for 2014! Be sure to check out our website before you meet your friends and family for your Thanksgiving dinner! There's lots to talk about. Start building your list of favorite trips using the "Add to Favorites" button on every tour page, then email or print the details! We love reading trip reports and travel stories that's why we've created special index pages so that you can easily view them from one report to another. Don't forget to read Francisca's report when she visited some of our partners in France, Italy, Greece, and Spain! See below. 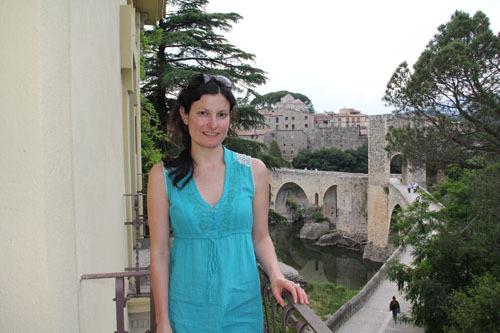 “I had a great time in the Provence, what a beautiful country! I enjoyed staying at the main guesthouse, which is rustic, but has a lot of atmosphere. First of all, it has a real feeling of a country stay, with the paddocks right beside the rooms, so you can see and hear the horses at all times. There is a nice grassy yard set up with eating tables and hammocks. Dinners are eaten outside in the summer, prepared by amazing chef, Gael, who also happens to be a DJ, so you will never lack good music when he’s around! He will surprise you with impressive looking and tasting French and international dishes. The picnic lunches while on the rides were amazing too. They’d bring up a tablecloth and a variety of dishes, salads, breads and cheeses, local wine, and set up a yummy gourmet picnic in the middle of nowhere! 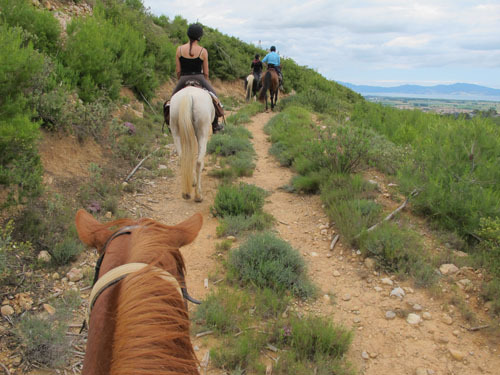 And of course, the Provence is just perfect country for horseback riding. It has the most amazing scenery, especially in early summer, when the lavender fields bloom. 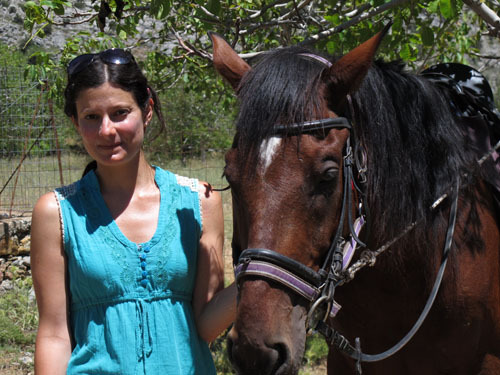 We rode across vineyards, forests, meadows, and one of my highlights: we went swimming in the river with the horses! 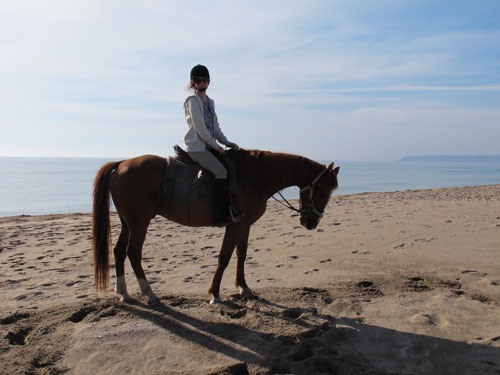 Another beautiful experience for me was to witness one of the girl guides initiating a young horse into the saddle. I saw how she patiently first showed him the bridle and the saddle, and then started fitting him with the gear, very slowly and respectfully, always patting and reassuring him. And he would willingly allow it because he trusted her! She then made attempts to mount, she put some weight on his back so he would get used to how it felt. One step at a time, she finally mounted and was helped by Cedric, who was holding the horse by the reins. And they went for a little walk. I will never forget the shine in the eyes of that horse, his youth showing, his look of wonder and curiosity, and above all, his trust in the girl who was working with him. I feel blessed and honoured for having this experience, for being there to witness this magic happening, and the beauty of natural horsemanship. I am touched by it even when I’m writing these lines…”. “This is a wonderful place, it’s just how you imagine Italy! I can’t say enough about it. Beautiful, lush and green country, delicious food and entertaining hosts, where you will get to stay at a spacious and comfortable farmhouse, with very nice and tastefully decorated rooms overlooking the paddocks. And you will get to ride the most awesome and fast quarter horses ever! These horses are exceptional, fit, well trained, so willing and responsive! They are a real pleasure to ride. You will canter on grassy hills, ride across forests, villages, churches and castles. But the highlight for me, was riding in the mountains near Malga San Giorgio. The landscape here is incredible: perfect green hills and slopes crossed by white dusty roads, scattered with small ponds, pasturing cows, goats and sheep, on a background of high snow caped peaks and impressive rock formations. 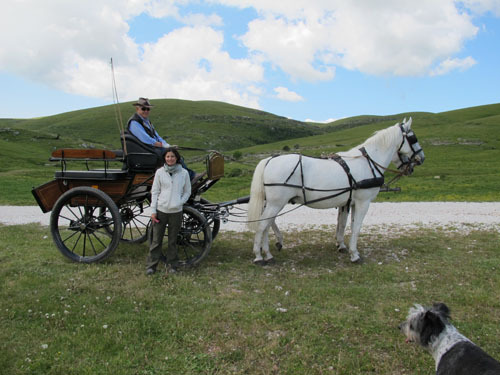 We were taken on a beautiful old-fashioned carriage pulled by two gorgeous Lippizan horses and driven by a friend of Antonella, who is the president of the Italian Carriage Association. He is a delightful man himself, and has a masterful command of the carriage and the horses; it is impressive to see what he can get them do by just using his soft voice. This is one of the most beautiful and scenic experiences I’ve ever had in my life. I will confess the beauty of it was such; it made me want to cry…. Highly recommend it! Antonella can arrange to take guests, especially non-riders, through these highlands on the carriage. It’s so worth doing it! We stopped for lunch at a small country eatery/cheese factory, where we had some home made ñoquis and local wine, while the horses were grazing nearby. Then we visited the cheese factory where visitors can buy some fresh cheeses”. “On my stay, I got to ride the beautiful and spirited Charly. He is such a sweetheart of a horse. Antonella called for an experienced rider for this horse, and I volunteered. Not that he was difficult or anything, he’s just very eager and happy to go. It felt like as if he was trying to read my mind, guessing that I wanted to increase the pace, even before I knew it! But he is very sensitive and we got along perfectly. He had an amazing start and the fastest gallop I’ve ever experienced. So thrilling, but it never felt unsafe because he was very responsive and smooth to stop, no problem. This is what I call a well-trained and happy horse. “I rode an amazing horse, Altiu, a beautiful golden coloured English-Arab cross who used to compete in endurance races. Because of this, he’s tireless and has the longest breath ever! I noticed how fit and used to the long trails he was, when we arrived at camp at the end of the riding days, and the other horses were sweaty, but he wasn’t – he looked like he’d just come back from a pleasurable little go out! At first I noticed he was just a little wary of me, like wondering who this new rider was, and when cleaning his feet on the first day I met him, he moved around a little nervous. But after a while of riding he got confident and relaxed, and I got the feeling he would happily take me to the end of the world! 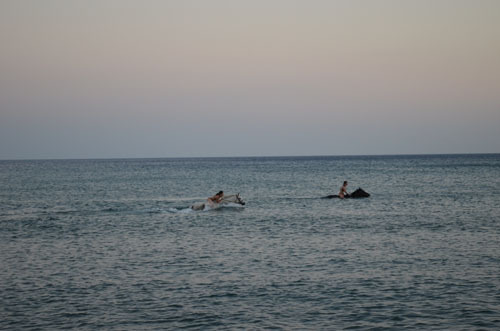 Or at least on the most wonderful beach canter ever! I felt so safe riding him, he was very sure-footed, never tripped, willing and forward going, but never tried to run away and was very sensitive and responsive to what I asked of him. A sweet, awesome and very handsome horse”. 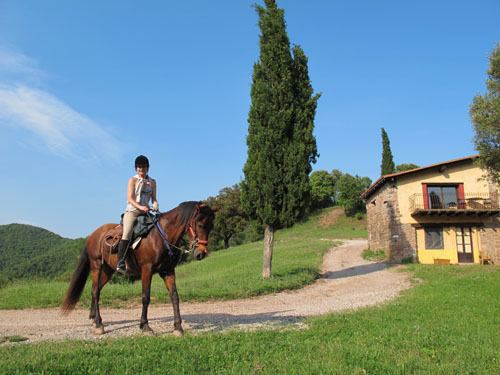 “I greatly enjoyed my stay at Mas Alba and riding around the surrounding countryside. 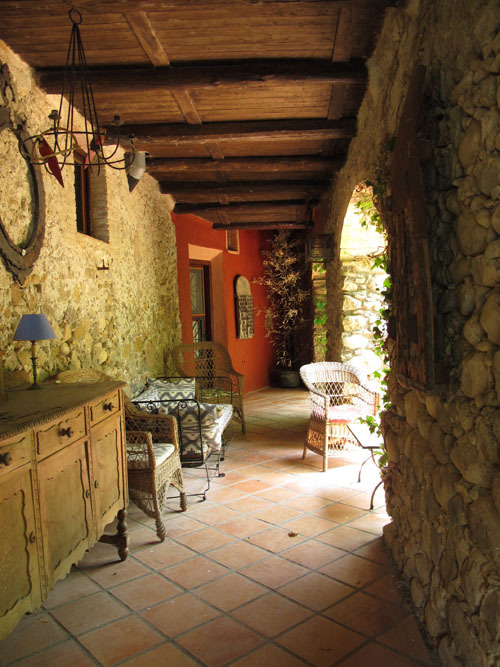 The house is a big old catalan masía, full of history. The rooms are comfortable, with their own bathroom and decorated in a country style. It has a big dinning room that opens to a backyard with a swimming pool and nice views. There is a goat cheese factory in the premises, so you will be delighted everyday, sampling different types of fresh cheeses! 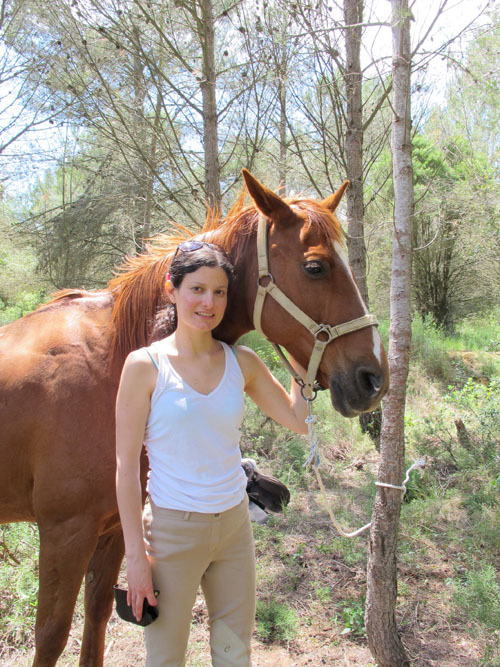 I went on a couple of pleasurable day rides, on forest trails, meadows and hills. We crossed a river and had lunch at a small village restaurant. 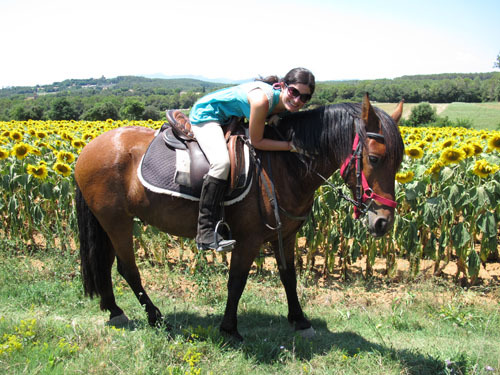 The highlights for me were the canters on flat plains and forest trails, and especially riding along the sunflower fields! How much beauty and bright colours all around! Just the perfect spot for a photo session! Another thing I really enjoyed was the visit to the Senillosa Purebred Spanish breeding farm. The farm is in itself a work of art; it has a big lagoon with ducks and swans, and extensive green fields and pastures. Here we were introduced to the most beautiful Spanish horses; impressive stallions and sweet mares with their foals, and we were offered a riding demonstration - an amazing display of fine training and movement”. “I rode Café, a Spanish purebred 6-year-old horse that even being so young, was well trained and responsive. He is in fact one of, if not the most, comfortable horse I’ve ever ridden. He has the softest movements and flow. His trot and canter felt like riding on heaven! He’s a fantastic horse. 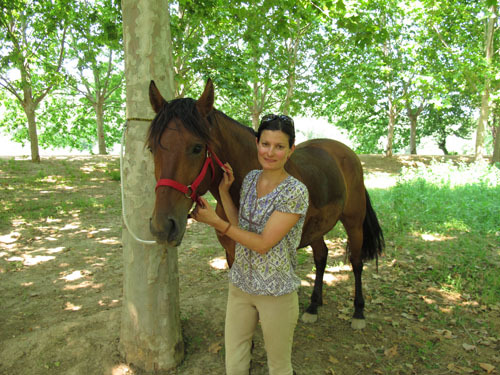 Our guide, Katrin, told me how it is very common that riders who come here on holiday fall in love with their horses and then offer to buy them! I would have certainly loved to keep Café for myself. Their horses are trained using natural horsemanship methods, and live in outside paddocks year round, which I think accounts for well balanced and calm horses that are tempered in character, used to life outside, so they don’t spook easily”. Today at 11AM the first Aerolineas Argentinas flight since June 4th flew to Bariloche and LAN is starting to fly again too. Authorities have informed that conditions are safe for flights not being the ashes a major concern now. Following up on our information of LAN regional flights from the Buenos Aires domestic airport, we are pleased to inform that the LAN Chile flight LA490 continues to fly to Santiago de Chile. All others have been rescheduled from Ezeiza international airport. In an effort to provide aid to the people and organizations that are currently working to rescue horses in the areas devastated by the storm in Burke, Cleveland and Rutherford counties, Stolen Horse International, also known as NetPosse.com, is offering flyers and a webpage, for disaster related missing horses and animals, on its website, www.netposse.com. NetPosse.com is currently accepting reports for all misplaced animals in all areas affected by the storms. This is a FREE LISTING service for the storm-torn areas that need to discover the fate of their animals. "The images seen and the stories we have heard have caused great concern for us. We would like to help the best we can. We invite anyone who is missing a horse to file a report with their animal's information on our site. “said Debi Metcalfe, Foundation President. Metcalfe continues, "Although Stolen Horse International does not have a team to send to the areas of devastation we do have volunteers who work with those teams. We will be glad to assist rescues organizations and government agencies by giving the animals an established place online to be seen by the public. Reuniting owners separated from their horses is what we do best. In disaster situations we extend our services to all livestock animals and pets." We are requesting that organizations and individuals rescuing horses, or those missing horses to utilize these services in order to reunite horses and owners as quickly and efficiently as possible and to notify us at by phone or email of victims that need our help, or to assist victims in filing a report on netposse.com as soon as possible. We are coordinating our efforts with the volunteers in the staging areas in hopes that no animal gets left behind. With a website visited by tens of thousands of visitors each month and it webpages viewed close to 6 million times in 2011, Stolen Horse International, Inc./NetPosse.com is a key resource for all equestrians, providing valuable information to prevent horse theft, and assistance in recovering lost, stolen, or missing horses. Utilizing the speed of the internet, NetPosse can round up a modern day version of a posse within minutes of an online report being filed. A precursor to the familiar "Amber Alert" instant response system for missing children, a call-to-action goes out to a network of individuals, businesses, law enforcement and recovery specialists intent on returning lost horses or property. Stolen Horse International (aka, NetPosse.com, a 501(c)(3) nonprofit organization) began in 1998 by Debi and Harold Metcalfe, Shelby, NC, after the recovery of their stolen horse, Idaho. Sharing all of the procedures they had learned during their 51-week effort to find Idaho, it has become a valuable resource for thousands of horse owners. Contributions to it are tax-deductible as charitable contributions. Oats have historically played a major role in the equine diet, but very few people understand the nutritional benefits oats have over many other cereal grains. One of those benefits may include preventing colic. Oats: The Horse-Healthy Grain, written by Dr. Laurie Lawrence of the University of Kentucky, discusses the positive effect oats can have on colic risk. The Prairie Oat Growers Association commissioned the research study, a summary of more than 260 published research documents, to assess past research surrounding the nutritional benefits of oats. Of the many topics discussed in the study, colic is one that resonates with most horse owners. 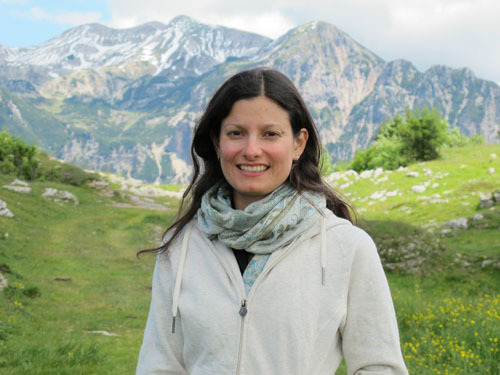 Referring to a research study conducted in 2009 , Dr. Lawrence reports, “The incomplete digestion of starch in the small intestine is an important link between increased colic risk and diet.” It has been suggested that colic risk is heightened when large amounts of starch reach the large intestine, where it is then rapidly fermented. Oats have higher small intestinal digestibility than most other grains, including corn. This means when feeding oats, less starch is reaching the large intestine. Several other research studies have been conducted to test starch digestibility, but none currently proves that oats can reduce the risk of colic. As the Equine Feed Oat Project continues to commission research, the effect of oats on colic risk will definitely be considered. To show support for the prevention and treatment of colic, the Equine Feed Oat Project recently attended and sponsored the 10th International Equine Colic Research Symposium in Indianapolis, Indiana hosted by the American Association of Equine Practitioners. A summary of Dr. Lawrence's study may be downloaded at www.equineoats.org. If you are interested in reading Dr. Lawrence’s completed study, contact hailee@equineoats.org. The Equine Feed Oat Project (EFOP) is an initiative of the Prairie Oat Growers Association (POGA), a volunteer farmer organization representing 20,000 hard-working Canadian oat growers. The EFOP was created in 2009 to research, educate and communicate information about oats to the equine industry. We realize there is a lot of conflicting information on the internet and various government websites around the world and would therefore like to give you the facts relating to the situation in Torres del Paine without the sensationalism and political motives of some media organizations. From our office base here in Puerto Natales we are monitoring the situation in the Park closely. b) to ensure our itineraries are adjusted where necessary to ensure ongoing quality. 1. To ensure all clients currently travelling with us are safe and can continue with their trips as planned to the best of our abilities while ensuring the most memorable Patagonia experience possible. 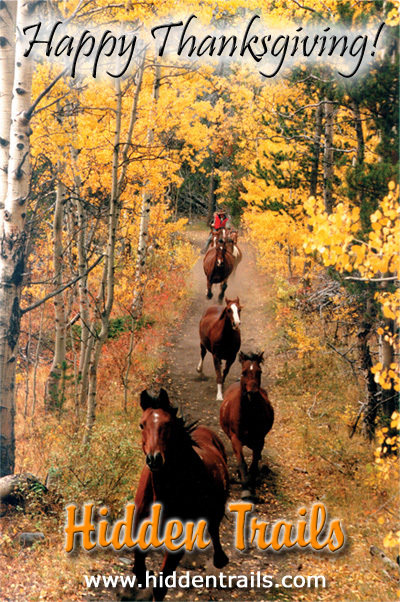 b) where we feel that due to the fire the quality of a particular hike or ride has been seriously diminished. We appreciate your patience with this. 3. To assess all of our itineraries for the longer term (February and beyond) making the changes necessary to maintain trip quality, diverse visual appeal (i.e. a good mix of forests, lakes, mountains and glaciers) and activity enjoyment. The fire affected mainly the areas between Grey Glacier and Pehoe and south towards admin, Pudeto (heading east to Salto Grande, Explora and Camping Pehoe), Paine Grande and east towards Lago Skottsberg and then south east towards Laguna Verde. The fire is now under control and the Park partially re-opened as planned yesterday at 0800 hours. This tragic incident caused by the carelessness of one individual has had a big effect on residents, guides, local communities and all of Chile. Torres del Paine is a precious resource and one we must protect and value at all costs. We have been reminded of the power of nature and our own relative insignificance. In spite of what has happened, it is important to remember that a relatively small portion of the Park’s surface area was affected by the fire (just 5% which equates to just over 12,000 hectares). There are still many beautiful areas to explore and enjoy. The re-opening which took place yesterday began in the northern sector of the park and includes: Laguna Azul, Laguna Amarga, Campamento Cuernos, Campamento Serón, Campamento Los Perros. Lago Paine and Dickson (the latter is restricted to guided groups). The community of Rio Serrano is also open as is the entire Serrano River and area which forms the Bernardo O’Higgins National Park. 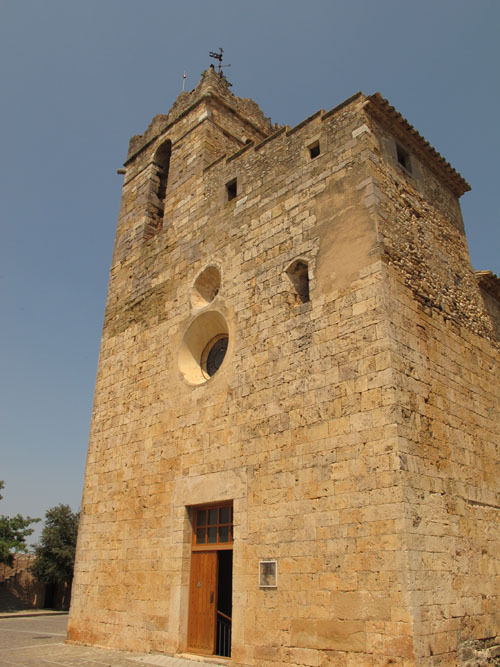 Hosteria Las Torres and associated refugios are open. No hotels or refugios were damaged in the fire. 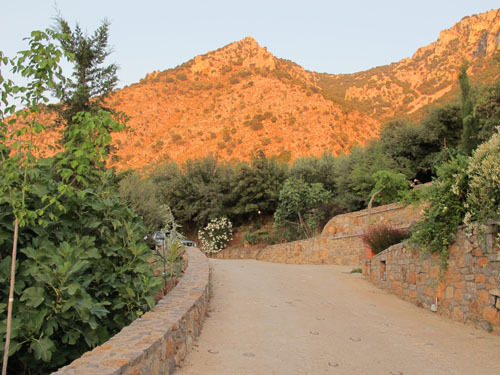 Hosteria Lago Grey is closed until 9th January as they are assisting and accommodating the fire and park authorities. There is normal transit to/from Torres del Paine with the Laguna Amarga entrance open. Our guides are today in the Park checking the hike to the base of Las Torres but hope to offer this again very soon. The areas that were unaffected by the fire offer a multitude of magnificent vistas, mountain and lake views, glaciers and wildlife. We are planning on taking pictures shortly so you can see for yourselves that Torres del Paine is still there in all its splendour. We see recent events as an opportunity to innovate and explore new trails - both in the Park and beyond. As we speak, we are looking at some pristine new areas such as Balmaceda, Serrano, the border area close to Argentina and more. We know the area better than anyone, leaving us plenty of options and alternative routes which are as beautiful and exciting as the originals. 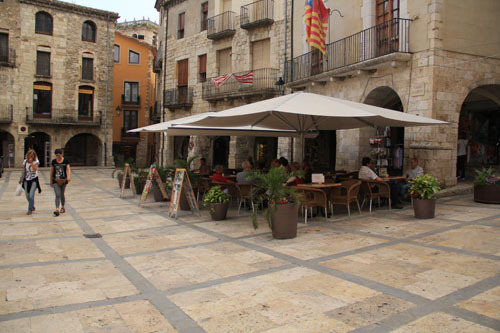 We have the advantage of the exclusivity and privacy in some of these areas that our clients prefer. Given that the hike close to Grey Glacier was affected we are hiking new routes close to other glaciers. We have always loved Glacier Dickson and will be diverting some groups there. We also love Glaciers Pingo, Tyndall, Geike, Serrano and more. Please see below a map of the Park which shows the area affected by the fire in the grey shading. Note: this map has been produced as close to reality as possible. We will be informing you of new trips we are about to launch shortly and will confirm any permanent itinerary changes to existing trips in the coming weeks. 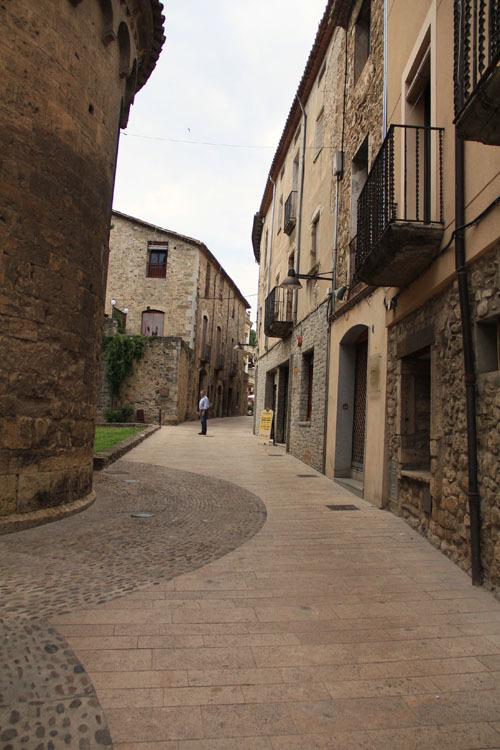 Some of the new trips and changes will take place in areas never before open to tourism. The Ecuadorian government has eliminated the fuel subsidies for the flights to the Galapagos Islands. Rates will have a "fuel surcharge" of $50 for Aerogal and $70 for TAME flights - each way. If you pay for your ticket by Dec 29, 2011 - TAME has waived this surcharge for flights in 2012. Flights to Belize are now at rock bottom prices - act fast - these won't last! We still have some spaces over the holidays on our riding tours in Belize -- here is your chandce ! It's a great opportunity to get away with some spectacular savings this winter season. Delta and Continental are offering heavily discounted pricing on many flights to Belize from now through February. These are the best flight prices we've seen in over five years. We don't know how long these deals will be available, seats are limited on each flight ... so time is of the essence. If you want to get away from the winter chill - now's the time to act!